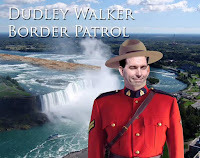 In the above video, the gentle reader will see part of Scott Walker's interview with Chuck Todd on Meet the Press this past Sunday, in which Walker said that building a wall along the Canadian-US border was a "legitimate issue." The gentle reader will also see Walker's appearance on Fox's "American Newsroom" on Tuesday, in which he denies ever talking about a fence along the border, calling it a "joke." “Do you want to build a wall north of here too?” Todd asked, noting that Walker has talked about building a wall along the U.S.-Mexico border to deter terrorism in addition to illegal immigration. Per Walker, we shouldn't pay attention to what he said but just to what he says he said. Walker really is a pathological liar, and now has entered farce land. And forgive me for repeating: He's a lightweight. I would love for Walker to be the nominee for the GOP, but we're not that lucky. Looking ahead to 2018, keep a look out for State Rep. Joel Kitchens (R-Sturgeon Bay) running for gov. Kitchens makes Walker appear a wonk by comparison. And Big Ag loves the guy. When was the last Mexican bomber caught? Missed that on the news. He needs to shut up, crawl back into the tunnels at the Capitol and maybe do the job he is getting paid to do. Though as a Wisconsin resident maybe we are better off with him out and about. I just hope the rest of the world realizes we are not all that stupid. When ever he makes a statement a spokesperson appears later to tell the world what Walker actually said not what he thinks he said! man...it’s crazy to thinkthis guy couldn’t come up with a better answer, even if it were a non answer? . What an idiot. I wonder if he knows that the prime minister of canada is our own hand picked “republican” and one of the first peole to make it in politics by trying pass a law requiring pee tests for people recieving government assistance? Gona be hard for harper to hawk Walker to his canadian supporters. I wonder whether Walker could ever have passed a pee test when running for office? His dazed eyes leave me doubtful of that.